I ordered the Aqua, the color is the same as on the website. Not dark, but not washed out. It is very soft and plush. It's a great TV blanket ! The Intelligent Design microlight plush blanket is designed to add warmth and color to your bed. 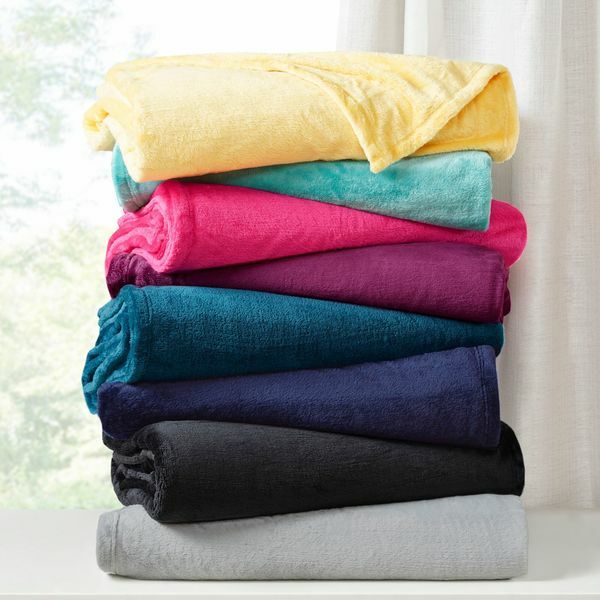 The irresistably soft and lofty blanket is light enough to be used during the warmest summer months and is perfect as a layering piece during the coldest of winters. The blanket is oversized for added comfort and warmth. Machine washable for easy care. Dimensions 92.0 In. X 90.0 In. X 0.25 In. Basic light and plush (super soft) micro fleece blanket. The full/queen fits the full sized bed perfectly and the color is exactly as pictured. Pros; super soft, pretty shade of light grey, generously sized (which is hard to find), doesn't shed, liteweight. Con: I won't call it a thin blanket but it doesn't have the warmth to it I have had in a similar blanket. I love it, but it's not the winter blanket I'd hoped. Great looking and soooo soft! Love the denim like navy blue color. This blanket is so soft and smooth, great colors. The color of this blanket is perfect! The design is very subtle but noticeable as well. I washed it in cold water and dried it on low heat and it came out just fine! This blanket is a good buy! This blanket is super soft. It is really light but keeps you warm. It fits my twin XL perfectly. I would by it again. It dries fast after washing. The color is as it shows in the picture. This blanket is perfect. So soft, even after a couple wash/dries. I absolutely adore it and the color is exactly what I wanted and had hoped for. To the person who reviewed this saying it sheds, you clearly didn't wash and dry it. It doesn't shed at all after washing AND DRYING it. As with all fabrics, do it right and you get the right results. All fluffy blankets like this need washing AND DRYING even at light settings to remove manufacturing fluff. This is a beautiful product. I absolutely love it to pieces. The color is rich and lighter than the color shown in the picture. It is more of a grape color. It was a tremendous value for the money. I am completely satisfied, and honestly, I wish I could buy a bunch more because I don't think I have ever had a blanket that is this soft! I like the fact that it is oversized, also, because I am not using a dust ruffle. This is probably my most favorite thing I have ordered so far. Love that this is oversized so the King fits our California King well. It's very soft too! I'm using it as an extra layer under our down alternative blanket (also purchased from Overstock). The only complaint I have is the top blanket slides around now but it's not an insurmountable problem. I ordered the yellow with summer in mind and it is beautiful. I've washed it and it is just as nice as the day I received it. Great purchase! This blanket is the TOPS!! When it was taken out of the wrapper, I felt it and couldn't believe the quality and softness. On our bed, it's so cuddly and warm. A rarity! So soft and relaxing feeling. Just like to kick the sheets aside and have this on my skin. This blanket is very soft and comfortable. I have noticed however, that there has been some minor shedding. I haven't washed it yet but am a little concerned that it may not hold up well over time. Great fabric. Thin material though. I absolutely love these blankets!! I have 4 of them now. They fit your mattress with plenty of blanket to tuck in at bottom. They are truly oversized. They wash up beautifully. Wish they came in more colors. thinner than I had wanted but very soft. I love the soft feel of the blanket. This blanket is wonderful!!!! It is very plush and incredibly warm for the weight. The color is just what I expected. I bought it for a spare bed, but am seriously considering changing it over to our regular bed! I would absolutely recommend it to a friend. "Do these blankets move at night, leaving the other person uncovered?" That would depend on how large the blanket is- by and large, this blanket is made of a material that tends to 'cling' a bit better than thinner more slippery fabrics. They actually stay put pretty well. This lovely plush blanket travels like a jet setter. I've turned it sideways hoping to slow its progress but it's still got places to go. It works okay for us as it's headed to husbands side and I don't need it after I've settled in. Have had similar type product.